I have said this many times before, but my favorite shoes have always been lightweight trainers. 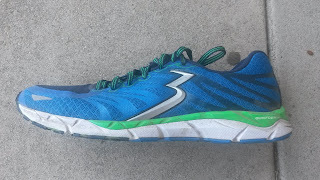 The 8-9 ounce range makes the perfect combination for training, workouts and longer races (one of my favorites of all time being the Brooks ST5). 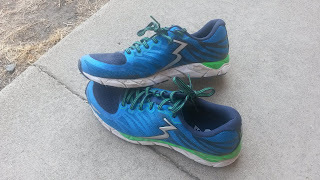 With the couple 361 shoes I have tried recently, one of my favorites for the longer workouts I have been doing in preparation for a move up to longer distances has been the KgM2 2. 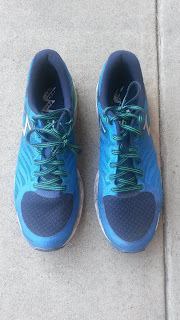 I did not try version 1 of this shoe, but have found it a great shoe for both my longer workouts as well as the rare daily trainer. How so? Let's talk. The upper does fit on the narrower side and is noticeable upon try on. Despite the narrower fit, the upper is fairly breathable and does stretch somewhat over time. The fit will definitely work well for those with medium to narrow feet. For those used to marathon racing shoes like the Adios, the fit will feel fairly familiar. Sizing wise I would go with your normal size (I am a size 10 mens and the length felt fine). Unlike many shoes, the KgM2 2 is somewhat narrower throughout. While many shoes will have narrow forefoot and wide heels, the fit is very consistent throughout the shoe. 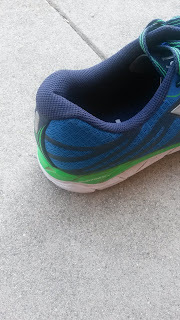 There is a heel counter in the shoe that is somewhat firmer but luckily gives some room for the achilles to flex through (ie does not go all the way up). Given the thinner upper I would caution those with sensitive achilles but I have not had any issues personally. 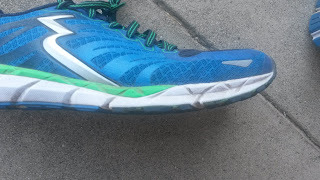 There is some upper cushioning in the heel, but like many lightweight trainers and distance racers it is thinner. Durability wise the upper is very good. 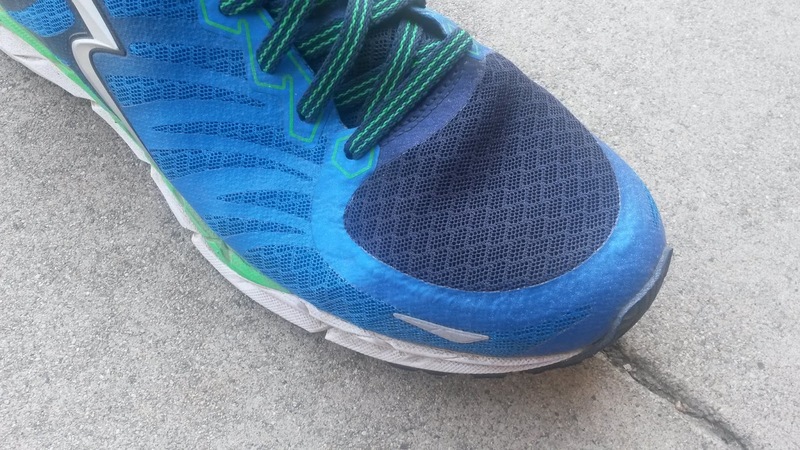 Despite the almost exclusive use of this shoe for hard workouts, I have not seen any seams come loose or tears occur. The 361 KgM2 2 comes in at 8.1 ounces (men's size 9) and has a 9-10mm drop. 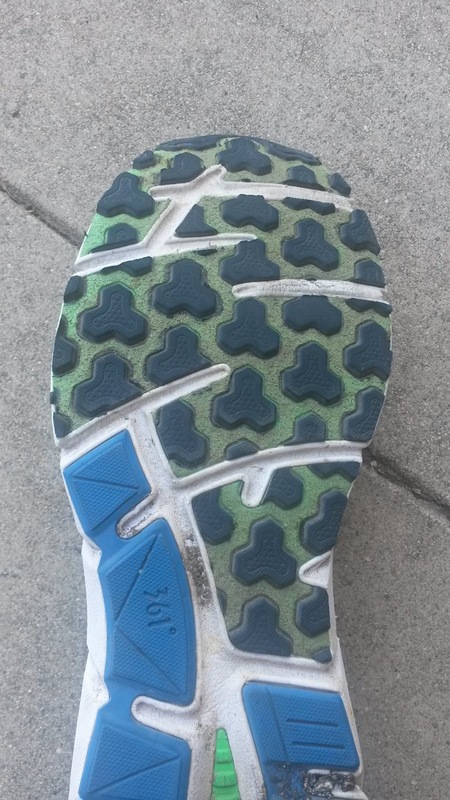 Unlike the Spire 2 (REVIEW), the KgM2 2 has a full contact outsole and does not have a midfoot shank. This definitely makes for a much smoother ride and I do not miss the midfoot shank. There are several offset flex grooves in the forefoot that also lend to a very smooth transition over the forefoot. Also different from the Spire 2, there is far less QU!CKFOAM in the midsole, especially in the forefoot. While the QU!CKFOAM still lends to the responsive ride and travels a good length of the lateral midsole, there is not the same protection afforded in the forefoot as the Spire 2. This is understandable to a degree given the lightweight trainer classification of the KgM2 2. There is a very slight posteriorlateral heel bevel, however the KgM2 does not have the smoothest heel landing. This may also be due to the slight posterior heel flare. For that reason this shoe may work better for those that land more mid and forefoot. However, there is a large placement of QU!CKFOAM (361's special midsole material) at the heel that lends to a responsive feel at landing. So while the landing at the posterior section may not be the smoothest, a lighter heel strike should be fine. The KgM2 2 is not the most stable shoe due to the narrower sole. This is to be somewhat expected from a narrower lightweight trainer. 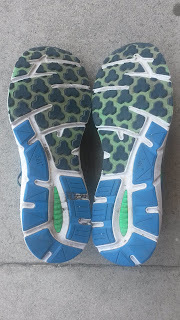 However, like the upper, the midfoot is not that much narrower than the rest of the sole. This lends to consistency throughout the ride, which can often be lost in lighter shoes that attempt to remove additional material from the midfoot. So for those with mediu to narrower feet again this shoe will be fine. 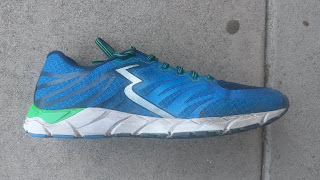 This shoe is designed as a lightweight trainer but I have used this shoe almost exclusively during hard workouts including long tempo runs, fartleks, trail uphill tempo runs and more. 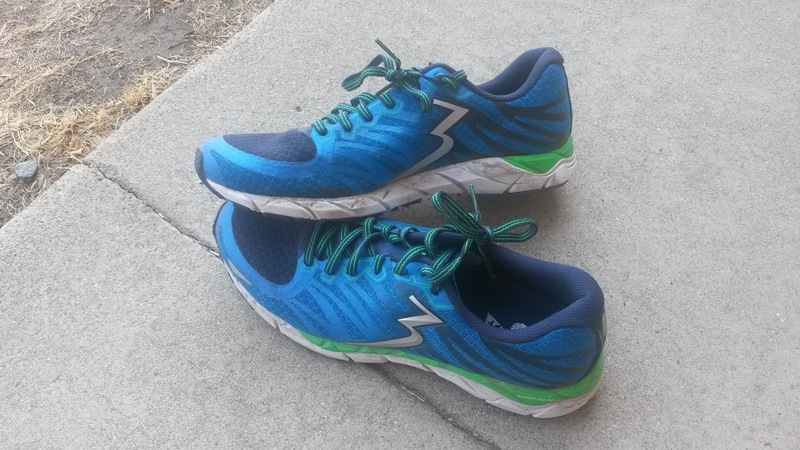 The 8.1 oz weight and 9mm drop make this shoe one of the first I would reach for as a marathon or half marathon racer. 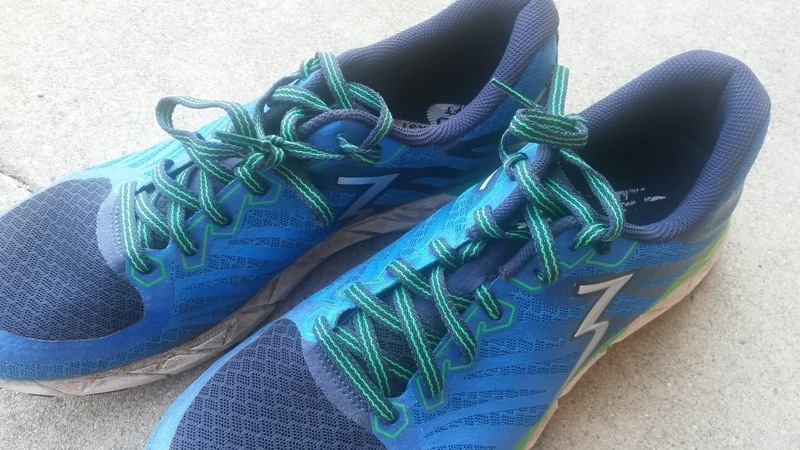 While this shoe is meant for the road, the very light lugs will work well for light trails. Despite that and the lightweight design, the KgM2 2 has been fairly durable over the intense miles I have put on this shoe. I have discussed why I prefer a heel bevel, which is the upward curve of the posterior section of the heel. This is meant to smooth out landings at the heel but from my perspective as a DPT is also important to maintain one of the more efficient elements of the human body. The heel bone is also known as the calcaneus. This bone has a curve at the posterior section that lends itself to helping roll the body forward upon initial contact at the heel. Image from Wikipedia. Notice the curve of the calcaneus bone (lower right). This is known as the heel rocker, which is one of the three rockers of the foot that help maintain forward momentum. If the heel was more pointed, the loading response phase of gait during heel strike would lead to a very fast downward rotation of the ankle and extreme tensile loads on the anterior tibialis/dorsiflexor muscles (muscles in the anterior lateral aspect of your lower leg). Having the calcaneus curved allows for not only a smoother transition upon landing, but allows the body to roll forward without the dorsiflexors having to pull it forward. Image from southfloridasportsmedicine.com Some individuals have a more posteriorly protruded calcaneus that others. Regardless you will always see (per my experience) a very rounded heel. It is for that reason that I always suggest companies bevel the heels of their shoes. It does not have to be extreme, but I have seen enough shin splints and anterior tibialis issues from shoes with stiff and rigid heels to know that this is not working for many individuals. Even in those individuals that have calcanei that protrude posteriorly, the calcaneus is still very rounded. While supporting the foot may help it, actively taking out things that benefit the human body are not usually suggested. This is where my constant frustration with the heel design of Asics has come from and I hope that 361 will move away from this like the majority of other companies have. Despite the narrower fit, I have really enjoyed the KgM2 2 for all the workouts I have done in them. This would definitely be a shoe I would choose over the Chaser (REVIEW) as a marathon/long distance racer due to the more nimble feel despite being a little less responsive (likely due to the lack of a carbon fiber plate like the one found in the Chaser). 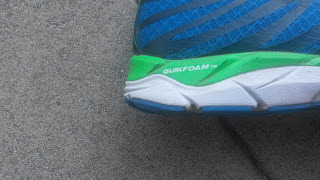 I do wish there was more QU!CKFOAM in the midsole, especially in the forefoot to continue what 361 did in the Spire 2. Additionally I would like to see 361 move away from more the older design of heels and increase the bevel to not only smooth out the landings but get the heel out of the way. Finally, while this is not a critique, I would love to see a light stability version of the KgM2 2 as I feel there is a lack of mild stability performance trainers. I continue to be impressed by 361 and look forward to their continued growth. ***Disclaimer: These shoes were provided free of charge in exchange for a review. I put at least 50-75 miles on trainers and 25 miles on racing flats. Currently my pair of KgM2 2's have 52 miles on them. A big thank you to 361 for sending these to me.